EPIC expands its line of wearable adventure cameras with their new EPIC 1080. 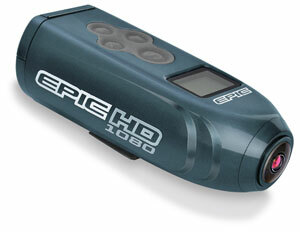 With the ability to record in stunning 1920x1080 High definition, the EPIC 1080 captures all the action of the hunt with sharp, high-resolution video and crisp, clear audio. The 168º wide-angle lens brings true perspective to the video, with the option of five different video resolution settings. The EPIC 1080 also doubles as a still image camera with the ability to shoot 8mp images with an action setting of up to 9 sequential images. External LCD screen displays number of video files in memory, as well as battery life and resolution setting. With multiple mounting devices the EPIC 1080 is ready for any hunting adventure. A perfect compliment to the EPIC Adventure Camera is the new EPIC Viewer. This compact pocket size LCD viewer allows the user to preview the camera's field of view when mounted, knowing exactly what the camera will be recording. That's not all! After you capture your event; plug the camera in to the viewer and check out your HD video complete with sound. The EPIC viewer plugs into the camera's video out jack when needed. Smaller than most cell phones the viewer is compact enough to take anywhere.